The 2015 Dodge Dart is one of the best-looking small cars for sale today. Come see them for yourself at Sulphur Springs Chrysler Dodge Jeep Ram, where we have all models and options available for drivers in Tyler and Greenville, TX to try and buy. The sporty, fun 2015 Dodge Dart is available in five distinct trim levels, from the affordable SE, the 40+mpg Aero, and the extra sporty GT. All Dart models have the option of a six-speed manual or automatic transmission, except the Limited, which is automatic only. 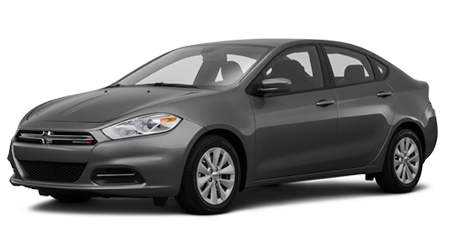 The base Dart SE comes standard with a 2.0-liter four-cylinder, power windows, tilt/telescoping steering, and a four-speaker stereo with CD player and auxiliary input jack. Add the Convenience package to get air-conditioning, keyless entry, power locks, cruise control, Bluetooth phone and audio connectivity, and special underbody aero trim for better mileage. Move up to the Dart SXT and get the SE options, plus 16" alloy wheels, automatic headlights, upgraded interior trimmings, a six-speaker stereo, and a more powerful 2.4-liter MultiAir four-cylinder. Add the Uconnect group and get an 8" touchscreen infotainment interface with smartphone control, rearview camera, and more. The Sun/Sound group includes all that, plus a sunroof and Alpine stereo with nine speakers. A Cold Weather group comes with heated seats and mirrors, plus remote start (on automatic models). Then there's the Rallye/California group which gets 17" alloys, sport-tuned suspension, fog lights, and special trim and aero enhancements. The sportiest of the SXT packages is the Blacktop with unique 18" wheels and trim on top of the other sports options. Standing alone is the Dart Aero with its turbocharged 1.4-liter I4, but it is the fuel economy champ. Added to the basic SXT options are special low rolling-resistance tires, active grill shutters, and under-car aerodynamic enhancements, plus all the state of the art electronic safety features from the GT and Limited Technology package. The Dart Aero with the manual transmission is EPA-rated at 41 mpg on the highway, while the automatic offers 40 mpg. The Dart GT is the sportiest of the bunch. It comes with 18" wheels, and an even tighter tuned suspension than the Rallye package, plus you get leather seats, special interior and exterior trim, and more. You can add an option Sun/Sound package to this level as well for better audio and sunroof included. The Limited is the top model with all the options from the SXT and GT, except the sportier suspension and tires. It adds the GPS navigation system to the 8" touchscreen Uconnect system and includes a sunroof, perforated leather seats, remote start, and chrome trim. Optional on this and the GT is the Technology group with blind-spot alerts, cross-traffic warnings, parking sensors, automatic HID xenon headlights, and rain-sensing wipers. If you want a small, good-looking sports sedan, come see us at Sulphur Springs CDJR and let us show you the 2015 Dodge Dart in all its flavors.